The Top Cap covers the very top planter in the 3Dponics Herb Garden, preventing dust and debris from falling into and contaminating the nutrient solution. The Top Cap covers the very top planter in the 3Dponics Herb Garden, preventing dust and debris from falling into and contaminating the nutrient solution. It also helps prevent the nutrient solution from evaporating. A slot in the cap holds the tubing in place and ensures that it doesn't get tangled. Know how to make this part better? Have ideas for new parts? 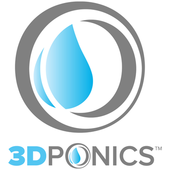 Visit our website (https://www.3dponics.com) and join our Google+ community (https://plus.google.com/u/0/communities/111638904033818784260) to take 3Dponics to the next level! Ready to print this part? Compare 3D-printing prices across today's top service providers and get the lowest price for your 3D-printing project. Get your quote now at https://www.3Dprintler.com.